English Renaissance theatre is English drama written between the Reformation and the closure of the theaters in 1642, after the Puritan revolution. It may also be called early modern English theatre. 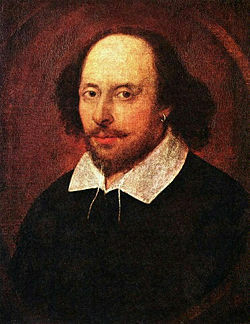 It includes the drama of William Shakespeare, along with many other famous dramatists. Renaissance theater derived from several medieval theater traditions, such as the mystery plays that formed a part of religious festivals in England and other parts of Europe during the Middle Ages. The mystery plays were complex retellings of legends based on biblical themes, originally performed in churches but later becoming more linked to the secular celebrations that grew up around religious festivals. Other sources include the morality plays that evolved out of the mysteries, and the "University drama" that attempted to recreate Greek tragedy. The Italian tradition of Commedia dell'arte as well as the elaborate masques frequently presented at court came to play roles in the shaping of public theater. Companies of players attached to households of leading noblemen and performing seasonally in various locations existed before the reign of Elizabeth I. These became the foundation for the professional players that performed on the Elizabethan stage. The tours of these players gradually replaced the performances of the mystery and morality plays by local players, and a 1572 law eliminated the remaining companies lacking formal patronage by labeling them vagabonds. At court as well, the performance of masques by courtiers and other amateurs, apparently common in the early years of Elizabeth, was replaced by the professional companies with noble patrons, who grew in number and quality during her reign. The City of London authorities were generally hostile to public performances, but its hostility was overwhelmed by the Queen's taste for plays and the Privy Council's support. Theaters sprang up in suburbs, especially in the liberty of Southwark, accessible across the Thames to city dwellers, but beyond the authority's control. The companies maintained the pretense that their public performances were mere rehearsals for the frequent performances before the Queen, but while the latter did grant prestige, the former were the real source of the income professional players required. Along with the economics of the profession, the character of the drama changed toward the end of the period. Under Elizabeth, the drama was a unified expression as far as social class was concerned: the Court watched the same plays the commoners saw in the public playhouses. With the development of the private theaters, drama became more oriented toward the tastes and values of an upper-class audience. By the later part of the reign of Charles I, few new plays were being written for the public theaters, which sustained themselves on the accumulated works of the previous decades. 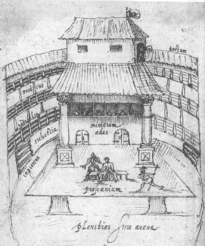 A 1596 sketch of a performance in progress on the thrust stage of The Swan, a typical circular Elizabethan open-roof playhouse. The establishment of large and profitable public theaters was an essential enabling factor in the success of English Renaissance drama—once they were in operation, drama could become a fixed and permanent, rather than a transitory, phenomenon. The crucial initiating development was the building of The Theatre by James Burbage, in Shoreditch in 1576. The Theatre was rapidly followed by the nearby Curtain Theatre (1577), the Rose (1587), the Swan (1595), the Globe (1599), the Fortune (1600), and the Red Bull (1604). Archaeological excavations on the foundations of the Rose and the Globe in the late twentieth century showed that all the London theatres had individual differences; yet their common function necessitated a similar general plan. The public theaters were three stories high, and built around an open space at the center. Usually polygonal in plan to give an overall rounded effect (though the Red Bull and the first Fortune were square), the three levels of inward-facing galleries overlooked the open center, into which jutted the stage—essentially a platform surrounded on three sides by the audience, only the rear being restricted for the entrances and exits of the actors and seating for the musicians. The upper level behind the stage could be used as a balcony, as in Romeo and Juliet or Antony and Cleopatra, or as a position from which an actor could harangue a crowd, as in Julius Caesar. Usually built of timber, lath, and plaster and with thatched roofs, the early theaters were vulnerable to fire, and were replaced (when necessary) with stronger structures. When the Globe burned down in June 1613, it was rebuilt with a tile roof; when the Fortune burned down in December 1621, it was rebuilt in brick (and apparently was no longer square). A different model was developed with the Blackfriars Theatre, which came into regular use on a longterm basis in 1599. (The Blackfriars site was used as a theatre in the 1576-84 period; but it became a regular venue for drama only later.) The Blackfriars was small in comparison to the earlier theaters and roofed rather than open to the sky; it resembled a modern theater in ways that its predecessors did not. Other small enclosed theaters followed, notably the Whitefriars (1608) and the Cockpit (1617). With the building of the Salisbury Court Theatre in 1629 near the site of the defunct Whitefriars, the London audience had six theaters to choose from: three surviving large open-air "public" theaters, the Globe, the Fortune, and the Red Bull, and three smaller enclosed "private" theaters, the Blackfriars, the Cockpit, and the Salisbury Court. (Other "private" theaters of the era included the theater near St Paul's Cathedral used by the Children of Paul's and the occasionally-used Cockpit-in-Court.) Audiences of the 1630s benefited from a half-century of vigorous dramaturgical development; the plays of Marlowe and Shakespeare and their contemporaries were still being performed on a regular basis (mostly at the public theaters), while the newest works of the newest playwrights were abundant as well (mainly at the private theaters). Around 1580, when both the Theatre and the Curtain were full on summer days, the total theater capacity of London was about 5000 spectators. With the building of new theater facilities and the formation of new companies, the capital's total theatre capacity exceeded 10,000 after 1610. In 1580, the poorest citizens could purchase admittance to the Curtain or the Theatre for a penny; in 1640, their counterparts could gain admittance to the Globe, the Cockpit, or the Red Bull—for exactly the same price. (Ticket prices at the private theaters were five or six times higher). The acting companies functioned on a repertory system; unlike modern productions that can run for months or years on end, the troupes of this era rarely acted the same play two days in a row. Thomas Middleton's A Game at Chess ran for nine straight performances in August 1624, before it was closed by the authorities—but this was due to the political content of the play and was a unique, unprecedented, and unrepeatable phenomenon. Consider the 1592 season of Lord Strange's Men at the Rose Theatre as far more representative: Between February 19 and June 23, the company played six days a week, minus Good Friday and two other days. They performed 23 different plays, some only once, and their most popular play of the season, The First Part of Hieronimo (based on Kyd's The Spanish Tragedy), 15 times. They never played the same play two days in a row, and rarely the same play twice in a week. The workload on the actors, especially the leading performers like Edward Alleyn, must have been tremendous. One distinctive feature of the companies was that they included only males. Until the reign of Charles II, female parts were played by adolescent boy players in women's costume. Since Elizabethan theater did not make use of lavish scenery, instead leaving the stage largely bare with a few key props, the main visual appeal on stage was in the costumes. Costumes were often bright in color and visually entrancing. Costumes were expensive, however, so usually players wore contemporary clothing regardless of the time period of the play. Occasionally, a lead character would wear a conventionalized version of more historically accurate garb, but secondary characters would nonetheless remain in contemporary clothing. The growing population of London, the growing wealth of its people, and their fondness for spectacle produced a dramatic literature of remarkable variety, quality, and extent. Although most of the plays written for the Elizabethan stage have been lost, over 600 remain extant. The men (no women were professional dramatists in this era) who wrote these plays were primarily self-made men from modest backgrounds. Some of them were educated at either Oxford or Cambridge, but many were not. Although William Shakespeare and Ben Jonson were actors, the majority do not seem to have been performers, and no major author who came on to the scene after 1600 is known to have supplemented his income by acting. Not all of the playwrights fit modern images of poets or intellectuals. Christopher Marlowe was killed in an apparent tavern brawl, while Ben Jonson killed an actor in a duel. Several probably were soldiers. Playwrights were normally paid in increments during the writing process, and if their play was accepted, they would also receive the proceeds from one day's performance. However, they had no ownership of the plays they wrote. Once a play was sold to a company, the company owned it, and the playwright had no control over casting, performance, revision, or publication. The profession of dramatist was challenging and far from lucrative. Entries in Philip Henslowe's Diary show that in the years around 1600, Henslowe paid as little as £6 or £7 per play. This was probably at the low end of the range, though even the best writers could not demand too much more. A playwright, working alone, could generally produce two plays a year at most; in the 1630s, Richard Brome signed a contract with the Salisbury Court Theatre to supply three plays a year, but found himself unable to meet the workload. Shakespeare produced fewer than 40 solo plays in a career that spanned more than two decades; he was financially successful because he was an actor and, most importantly, a shareholder in the company for which he acted and in the theaters they used. Ben Jonson achieved success as a purveyor of Court masques, and was talented at playing the patronage game that was an important part of the social and economic life of the era. Those who were playwrights pure and simple fared far less well; the biographies of early figures like George Peele and Robert Greene, and later ones like Brome and Philip Massinger, are marked by financial uncertainty, struggle, and poverty. Genres of the period included the history play, which depicted English or European history. Shakespeare’s plays about the lives of kings, such as Richard III and Henry V, belong to this category, as do Christopher Marlowe's Edward II and George Peele's Famous Chronicle of King Edward the First. There were also a number of history plays that dealt with more recent events, like A Larum for London, which dramatized the sack of Antwerp in 1576. Tragedy was a popular genre. Marlowe's tragedies were exceptionally popular, such as Dr. Faustus and The Jew of Malta. The audiences particularly liked revenge dramas, such as Thomas Kyd’s The Spanish Tragedy. Comedies were common, too. A sub-genre developed in this period was the city comedy, which deals satirically with life in London after the fashion of Roman New Comedy. Examples are Thomas Dekker's The Shoemaker's Holiday and Thomas Middleton's A Chaste Maid in Cheapside. Though marginalized, the older genres like pastoral (The Faithful Shepherdess, 1608), and even the morality play (Four Plays in One, c. 1608-13) could exert influences. After about 1610, the new hybrid sub-genre of the tragicomedy enjoyed an efflorescence, as did the masque throughout the reigns of the first two Stuart kings, James I and Charles I. Only a minority of the plays of English Renaissance theater were ever printed; of Heywood's 220 plays noted above, only about 20 were published in book form. A little over 600 plays were published in the period as a whole, most commonly in individual quarto editions. (Larger collected editions, like those of Shakespeare's, Ben Jonson's, and Beaumont and Fletcher's plays, were a late and limited development.) Through much of the modern era, it was thought that play texts were popular items among Renaissance readers that provided healthy profits for the stationers who printed and sold them. By the turn of the 21st century, the climate of scholarly opinion shifted somewhat on this belief: some contemporary researchers argue that publishing plays was a risky and marginal business—though this conclusion has been disputed by others. Some of the most successful publishers of the English Renaissance, like William Ponsonby or Edward Blount, rarely published plays. A very small number of plays from the era survived not in printed texts but in manuscript form. The rising Puritan movement was hostile to theater, which the Puritans thought promoted immorality. One of their most common complaints was the practice of boys dressing as women to play female roles. Politically, playwrights and actors were clients of the monarchy and aristocracy, and most supported the Royalist cause. The Puritan faction, long powerful in London, gained control of the city early in the English Civil War, and on September 2, 1642, ordered the closure of the London theaters. The theaters remained closed for most of the next eighteen years, re-opening after the Restoration of the monarchy in 1660. The re-opened theaters performed many of the plays of the previous era, though often in adapted forms; new genres of Restoration comedy and spectacle soon evolved, giving English theater of the later seventeenth century its distinctive character. English Renaissance theater is sometimes called "Elizabethan theatre." The term "Elizabethan theatre," however, covers only the plays written and performed publicly in England during the reign of Queen Elizabeth (1558–1603). As such, "Elizabethan theatre" is distinguished from Jacobean theatre (associated with the reign of King James I, 1603–1625), and Caroline theatre (associated with King Charles I, 1625 until the closure of the theatres in 1642). "English Renaissance theatre" or "early modern theatre" refers to all three sub-classifications taken together. ↑ Gurr, Shakespearean Stage, p. 12-18. ↑ Gurr, p. 123-31 and 142-6. ↑ Ann Jennalie Cook, The Privileged Playgoers of Shakespeare's London, 1576-1642 (Princeton, New Jersey: Princeton University Press, 1981). ↑ Halliday, Shakespeare Companion, p. 374. ↑ Gurr, Shakespearean Stage, p. 72. ↑ Halliday, p. 108-9, 374-5, 456-7. ↑ Peter W. M. Blayney, "The Publication of Playbooks," in: A New History of Early English Drama, John D. Cox and David Scott Kastan, eds. (New York: Columbia University Press, 1997). ↑ Alan B Framer and Zachary Lesser, "The Popularity of Playbooks Revisited," Shakespeare Quarterly 56:1 (Spring 2005): 1-32. Chambers, E.K. The Elizabethan Stage. Oxford: Clarendon Press, 1923. Gurr, Andrew. The Shakespearean Stage 1574–1642, 3rd edition. Cambridge: Cambridge University Press, 1992. ISBN 9780521078160. Halliday, F. E. A Shakespeare Companion 1564–1964. Baltimore: Penguin, 1964. History of "English Renaissance theatre"
This page was last modified on 23 August 2017, at 17:02.